"The Cabinet Makers at Taylor Made Cabinets, make the most beautiful doors." 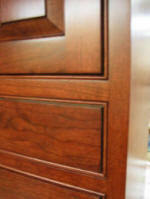 Here at Taylor Made Cabinets, we carefully match each piece of wood used for the door according to its natural shade. This is to disguise that there are two pieces being used. 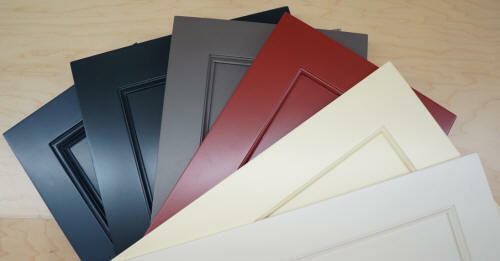 We also take the time to match the grain, giving each door a beautiful uniformed look. We use concealed & exposed hinges for doors that are heavy duty and easy to adjust, and our drawer slides are one of the best available. They are self-closing, concealed, and glide beautifully. 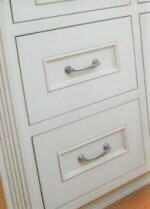 They can give a full extension to your drawers and pantry area. Taylor Made Cabinets are fully custom which means every thing is specially made for you. Our cabinets have higher quality material, custom sized to make the most of your space without needing wasteful fillers, and the cabinets are scribed to your walls. Perfect miter cuts and nice tight joints. A flush-fitting method, but a decorative wood edge (bead) is applied to the inside edge of the face frame that surrounds the door opening. This adds a little elegance to the simplicity of the previous square inset. Doors are placed standard over cabinets (overlay). No face-frame on the front of the cabinet. Box Construction is only 3/4" plywood with taped veneer front edge. Stain - Staining a cabinet will bring out the beauty of the wood grain, and we offer a full range from light & subtle to rich and dramatic. Colors range from natural, browns, reds, yellow-browns and red browns. Glaze - Hand-rubbed glazing is another beautiful technique which can be applied to painted, stained or natural woods. The glaze is applied by hand brushing it on, then carefully wiping off a desired amount leaving the glaze in nooks and grooves for an antiqued or artistic look. Paint - Traditional paint is sprayed on and is also available in any shade desired. Between each of the three coats of paint & primer that we apply, each piece is finely sanded for an ultra smooth result. The combinations are endless and your can count on Bob to help you make the best choice for the look that appeals mostly to you.